These are the most flavorful wings around. First off you will need to get some fresh cut wings. Marinate your wings for 1-2 hours in the Poke Sauce; use your judgment after marinating a few different times to the flavor you like best. 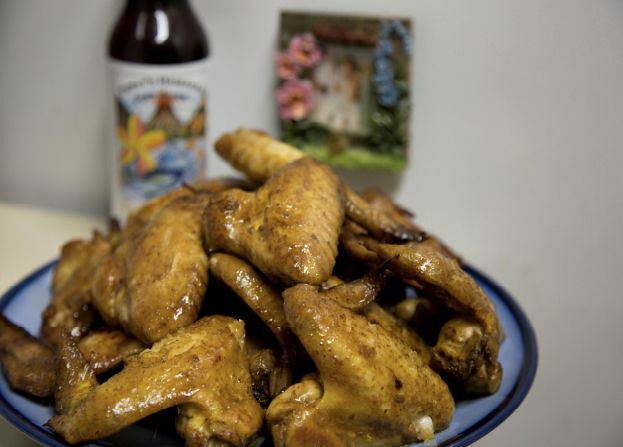 Throw wings on to a baking pan or glass Pyrex, but do not add your extra sauce from marinating. Bake for 45 minutes on 350, and then pull wings out of oven and throw on to the grill to finish them off. Brush lightly with your marinating sauce. Grill for 10-15 minutes, let cool and dig in! Some people prefer to use a touch of honey to the Poke Sauce for a thicker texture that allows the sauce to adhere better to the wings.